(Newser) – Researchers say that while there's no need for residents of Phoenix to panic, parts of their city are slowly and unstoppably sinking into the ground. Land subsidence caused by the extraction of huge quantities of groundwater over the decades is to blame, and the Arizona State University researchers say it's causing some parts of the metropolitan area to sink by roughly 0.75 inches a year, Sonoran News reports. Residents may not notice much change year to year, the researchers say, but over time, the problem will affect things like canals, utility lines, and sewers and, eventually, the foundations of buildings. The depletion of groundwater has changed the sediment under the area, so the drop is irreversible. I read the headline "Phoenix is slowly sinking" and thought that too many illegal immigrants were settling down there and their combined weight was making the city sink! Ok, it was a silly thought, but funny!! 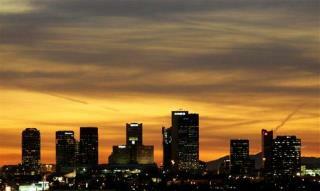 For years Phoenix has "banked" its excess water from the CAP in underground aquifers. It is why we have not yet had water use restrictions despite junior Colorado River status while severe restrictions in neighboring California are ongoing. I'm surprised that parts of the Valley had subsided because of that very fact which is easily searchable online. LOts of left winger total morons and hate mongers posting here I see.